What is a typical morning like before your kids leave for school? Rubiela: Each house has its own rules. Those are very simple standards the children can work out and be aware of. In my family, my children are woken up at 4.30 am, and at 4.45am they are normally getting up. Of course, at night they go to bed early. But what do they do next? Well, they make their beds and sort out their clothes. After that, they take a shower and are ready for having breakfast. Actually, they don't necessarily do it in that order, but that's what happens in general. It depends on their age. For example, Marlon, who is only 6 years old, always leaves his bed well-made, puts his sandals in the closet, leaves his underwear for the laundry, and doesn't forget about leaving the towels to dry before having breakfast. Those are simple things they can manage to do. Similarly, Brigitte and Melanie, who are 8 and 10, respectively, clean the mats, set the table, and dust off the furniture, among other simple things. The older children, on the other hand, help sweep or mop the floor of the areas we share. One, for example, cleans the bathroom; another cleans the kitchen, and so on. They also help carry the groceries to the kitchen or the pantry, because some of the things are a bit heavy. Everyone helps, so it doesn't take too long to finish. That's what we do from Monday through Sunday, well, except for Saturdays and Sundays when the children can sleep in and help with household chores later. And what is your role as an SOS mother? Rubiela: I am here to perform major duties. I prepare breakfast, wash the clothes, clean the kitchen, and go to the market, among other things. But in the morning I make sure the children wake up at the right time, so that they are not late at school. I like help the small children comb their hair or just make sure they have brushed their teeth and have put everything in their backpacks before leaving for school. And what is the role of the SOS aunt? Rubiela: The role of the SOS aunt - Olga in the case of my family - is to support the SOS mothers. The aunts don't stay with one family all the time. There are several SOS aunts at the village who support various houses according to a plan, but they are here, too, to support the families whenever, for example, we are sick or on vacation. Based on your experience, is it good to get up early? Rubiela: Of course! Although we are kind of forced to - given the school's schedule - I consider it highly beneficial to them, and also to me. We feel healthy and energetic, and we have plenty of time to do everything, especially household chores. I feel happy looking my house all set up before leaving and my children going to school. 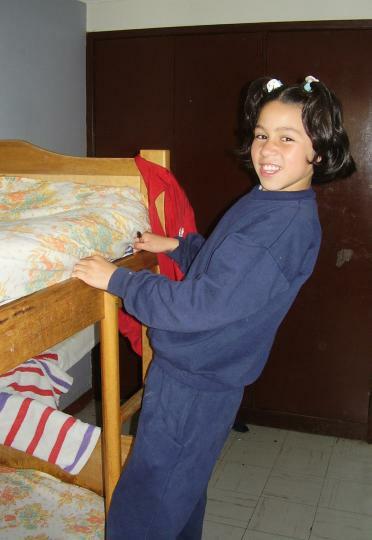 Rubiela is an experienced SOS mother at SOS Children's Village Bogotá who has been serving the organization for more than ten years. She is a very dynamic person and is currently in charge of nine happy children: a group of 4 siblings, two groups of 2 siblings, and a girl who only arrived recently.